Back in the 50’s, men who wanted to build their physique, ate whole foods, vegetables and meat. That meant a lot of money spent on healthy and fresh food, regular and boring shopping in the supermarket and spending a lot of time on preparing meals. To get desired results only with whole foods, men had to eat at least 7 times a day. And we’re talking large portions. With the rise of the fitness industry, a quicker way for gaining results has emerged – the supplements. Basically, to grow muscles and build a physique, you need the ingredients and amino acids that are found in food, but you need to take them in concentrated amounts. These ingredients are mainly associated with two basic processes in fitness: muscle recovery after a workout and a boosting performance during a workout. This is where supplementation helps as it is almost impossible to consume the needed amounts of food to achieve results. You don’t have the time, the money nor the digestive capacity for that much food. There are various types of supplements you can take, depending on the result you want to get, from performance boosters and fat burners to supplements for muscle growth. The basic supplements you should start the muscle recovery process with are whey and casein protein. 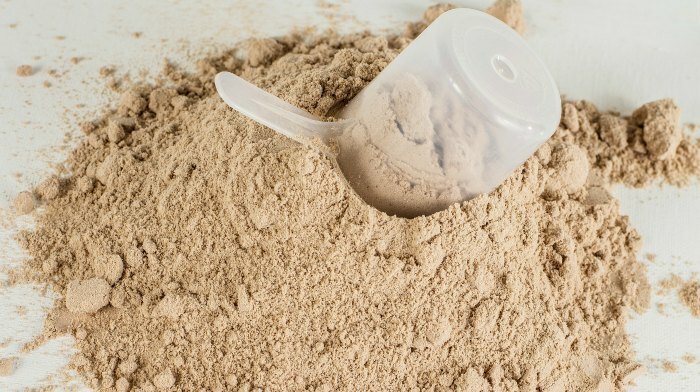 Here’s what you need to know before you buy protein powder. Casein is the name for a family of phosphoproteins, which is mainly found in mammalian milk. About 80% of the proteins in cow milk are from this family, and about 20-45% of human milk. In the supplementation industry, casein is used as a food additive because it contains a large amount of amino acids, carbohydrates, calcium and phosphorus. Casein forms a gel or a cloth in the stomach, which provides a sustained flow release of amino acids in the bloodstream that lasts for several hours. What does this mean? To get results, you need to increase protein synthesis and to decrease muscle breakdown. Now, casein protein is a slow protein; you can reach amino acids and protein synthesis in 3-4 hours. This means that you’ll achieve a slower muscle breakdown process. This also implies that you can’t base your results only on casein protein; you need something to boost the protein synthesis process. It is is good for your teeth, as it reduces the chances of eroding your enamel. The negative side of casein protein consumption is that it’s allergenic. People that are allergic to milk may experience allergy reaction. It can also cause you to bloat, due to the sodium it contains. Whey is a by-product of cheese; it’s the thin liquid layer that remains after making the cheese. It is less than 1% protein; that’s why it’s concentrated and dried up and transformed into a protein powder. You should buy protein powder, whey that is, and consume it together with the casein to get the maximum results from the synthesis and muscle breakdown reaction. Whey is known as a faster protein, and the main result you get from it is faster protein synthesis, meaning the metabolic process of protein is somewhere around 20 minutes (compared to casein, which is 3-4 hours). In about an hour, whey will be running through your bloodstream. Is a powerful antioxidant because it enhances gluthatione levels. Gluthatione is important because it helps maintain compounds such as iron in it’s oxidation phase in hemoglobin. The downsides are there are no results proving that whey is effective in protein degradation, which means it can’t be used alone for maximum effect. In conclusion, the debate whether to buy protein powder or to use only casein protein, comes down to the effects each has on exercising performance (as these supplements have other effects too). Therefore, one should not be used without the other, despite the general belief that these two should not be used in combination due to the canceling effect.